SS 321H Tubes, 321H Stainless Steel Pipes, SS UNS S32109 Pipes, ASTM A312 Stainless Steel WRN 1.4878 Seamless Pipes & Welded Tubes Supplier & Exporter in India. We, Neon Alloys manufacture & export these SS 321H Pipes and Tubes by using the contemporary machines and look into the quality fir to make the soaring grade products for our valuable patrons. SS 321 Pipes and Tubes by using the modern machines and investigate the quality to make the high grade products for our clients. 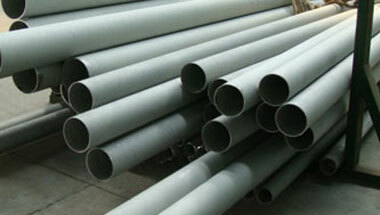 Our 321 / 321H IBR Pipes and Tubes are available in different size, thickness & specification as per clients’ requirements. Stainless Alloy 321H is a general purpose austenitic stainless steel that is stabilized against carbide precipitation and designed to work within the carbide precipitation temperature range 427 to 816°C (800 to 1500°F). Also known as UNS S32109, these pipes and tubes is non-magnetic in the annealed condition and can be hardened only by cold working. Meanwhile, titanium is added in these SS 321H Seamless Pipes to the alloy's composition, for to suppress grain boundary chromium carbide precipitation and reduce susceptibility to intergranular corrosion. These Stainless Steel 321H Pipes and Tubes are used in6 different application industries like oil & gas, shipbuilding, petrochemical, Nuclear Power Plants, Fertilizers Plants, Chemical Industries, water treatment, desalination, etc. Our stainless steel 321h product includes tubes and pipes, SS 321H Pipes, SS 321H Tubes, Stainless 321H Seamless Pipes & Tubes etc. These products are available at best possible prices which is another important feature exhibited by our products range. Stainless Steel 321H ERW Pipes, SS 321H Seamless Tubes, Steel 321H Welded Pipes, Stainless Steel 321H EFW Tubes, Stainless ASTM A213 321H Seamless Pipes Manufacturer in India. Turkey, Ethiopa, Africa, UAE, Tunisia, Democratic Republic of the Congo, Kuwait, Houston, Malaysia, Algeria, Indonesia, New Zealand, Peru, United States, Sudan, Cameroon, Italy, Iraq, Dubai, Vietnam, Russia, Nigeria, UK, Kazakhstan, Egypt, Mozambique, Angola, Iran, Jordan, Azerbaijan, Trinidad and Tobago, Saudi Arabia, Morocco, Uganda, Argentina, Germany, Chine, Venezuela, Canada, Bahrain, Sri Lanka, South Africa, Ghana, Australia, Colombia, Israel, London, Mexico, Thailand (Bangkok), Brazil. Antananarivo, Yaoundé, Bulawayo, Dubai, Hong Kong, Soweto, Tripoli, Pretoria, Istanbul, Maputo, Benin, Rabat, Port Harcourt, Cairo, Manama, Omdurman, Ouagadougou, Jerusalem, Brazzaville, Kinshasa, Kolwezi, Giza, Luanda, Lubumbashi, Abidjan, Riyadh, Abu Dhabi, Addis Ababa, Byblos, Dakar, Lagos, Freetown, Accra, Mogadishu, Jeddah, Kaduna, Dammam, Johannesburg, Bethlehem, Bamako, Amman, Ibadan, Lusaka, Doha, Subra al-Haymah, Alexandria, Algiers, Casablanca, Maiduguri, Durban, Aqaba, Tel Aviv, Nairobi, Fez, Kano, Singapore, Cairo, Beirut, Mecca, Data from the UN, Port Elizabeth, Cape Town, Harare, Colombo, Dar es Salaam, New York, Sharm el-Sheikh, Douala, Tehran, Kampala, Mbuji-Mayi, Khartoum, Conakry, Zaria, Muscat.